St Isaac’s Cathedral was considered to be Peter’s I patron saint. The birthday of Peter the Great was on the 30th of May in 1672. The 30th of May was marked by Orthodox Church as the Day of St. Isaac. Accord­ing to the legend, St. Isaac lived in the 4th century A.D. He protected Christians from the Roman Emper­or and heretic Valens, for which he was subjected to punishment. The Emperor Theodosius set St. Isaac free from the dungeon. The first wooden church dedicated to Saint Isaac of Dalmathy was built in 1710. That church was built on Peter’s order on the place where the the Bronze Horse­man stands now. Then the wooden church was replaced in 1727 by a stone building. This building was de­stroyed by fire and a new church far from the Neva was erected. At the beginning of the 19th century it was decided to build a cathedral. A competition for a new design was announced. Many famous architects took part in the competition. The victor was the architect August Montferrand. He submitted to Alexander I twenty-four projects for the cathedral. And in 1818 the construc­tion of the building began. It took 40 years (from 1818 to 1858) to build this magnificent cathedral. About half a million people took part in its building. Many of them died of hunger and of different diseases. When the building was completed repair work was immedi­ately started on the cathedral. It lasted many years. 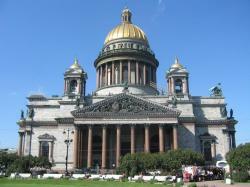 Forty-three types of stone and marble were used in the ornamentation of St. Isaac’s Cathedral. The cathedralis embellished with 382 sculptures, paintings and mo­saics. The columns of the iconostasis were faced with malachite and lapis lazuli. About 100kg of pure gold were used to gild the grand dome. The grand dome is 21.8m in diameter. On the porticoes and around the dome drum 72 monolith columns were installed weigh­ing from 114 to 64 tons. The interior area of the cathedral is 4600 sq.m. It can accommodate up to 12000 praying persons. The cathedral is 101.5m high and it is well seen from Peterhoff. The building is 111.5m long, and 97.6m wide. The building weights 300,000 tons. It has 562 steps up to its top. Its gilded cross is 30m higher than the spire of Admiralty and is only 20m lower than that of the Peter and Paul Fortress. The grand opening of the cathedral was on the 29th of May in 1858. Auguste Montferrand saw the grand opening of the cathedral. He died a month later. Be­fore his death Montferraud asked Alexander II for permission to be buried in one of St. Isaac’s crypts. The tsar refused his request. The architect was buried in Paris.